Heavy rain raises most rivers. 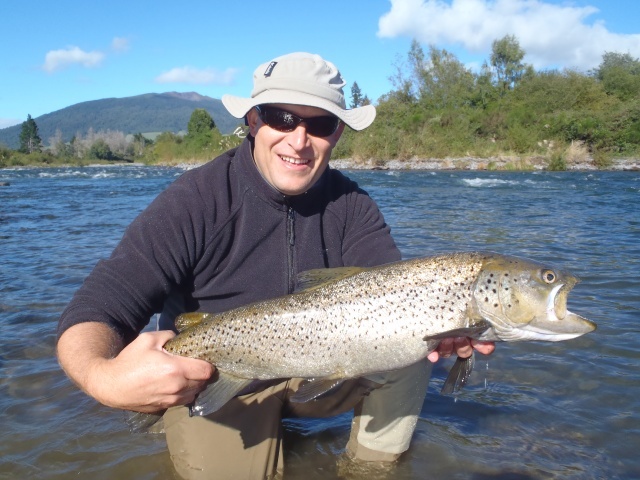 The last blogÂ I put together was positive towards our summer fishing with most rivers offering good dry fly fishing due to low water conditions but once again that has not lasted long. Following heavy rain over the weekend most back country rivers have again been coloured up and high which has once again made access impossible, hopefully by tomorrow they will be back to being ok. Taupo rivers also came up and dirty with the Tauranga Taupo appearing to be the worst for a couple of days but should be back to a good fishable level today. High water conditions always plays havoc with guiding plans and thsi season has been very hard to get a good handle on which has had me changing plans day to day just to try an get the best out of a bad situation. Matt Martin and his father Bruce are here again trying their luck for another week of bonding and have had ome reasonable results despite high conditions. We have had to switch things about and make alternative plan b, c, and d but they seem to be working out. 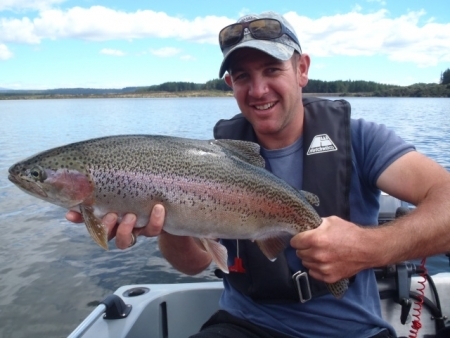 We fished the Tongariro for a day and found things hard going but did manage a very fresh good conditioned rainbow and a very nice brownie which is now Matt’s largest trout EVER. We have had many similar stories this year with the large amounts of browns coming high in the river this season and with the latest rain I think it would have moved a few more through again for anglers to tangle with. The Tongariro certainly has a good few fish in it but they seem to have a case of lock jaw which from time to time they all seem to get. We picked up this brownie by adjusting where we might find trout and started to look in the edges or the slack water of a pool where brownies tend to sit and lie. Fishing the shallower faster water certainly produced many small fish which would be lucky to be 300 grams, these fish are hanging around this year for some reason. Angling pressure again is almost nil and on the full day on the water we only saw two anglers which is almost un heard of for such a well known river which is respected all over the world. Great time to be getting to know the river and even after weeks of guiding I am still finding new pieces or changed water following the major flood of 700 cumecs. 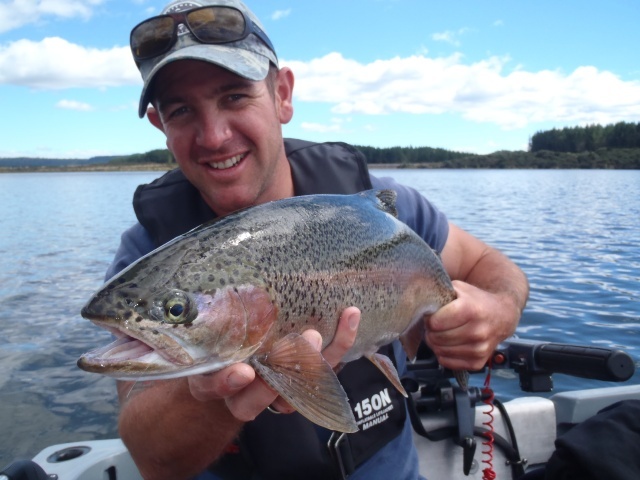 Winter fishing isÂ always a busy time of year to be in Turangi and on the river so it wold be advisable to get the jump on all other anglers and get to know it again now-some great holding water has opened up! Myself and Matt went for a look about on Lake O yesterday while his Dad Bruce was in Wellington shopping and had an absolute ball boating over 20 fish on both the nymph and wetfly. The weather was absoloutely stunning with a flat calm morning and a slight breeze on the water to just give the perfect ripple by lunch time.Â We spent most of the day drifting weed beds and fishing wind lanes which all proved to be holding good numbers of fish. The trout in this lake are in fantastic condition at the moment an have really put some top condition on over the past few months of summer. Insect life is great up here with thousands of insect casts floating in the surface film which has excited the trout in the lake and many fish can be seen sipping from the surface. There are a few anglers hitting this lake at the moment but with so many nooks and crannys you can really escape to your own little bay or run. We hit the back country again in the next few days so still got a few things to organize so better keep this one sort and get back to it. Hope your enjoying the last bit of summer and getting ready for the winter which is just around the corner.